If you missed Part 1, Click Here. For Part 2, Click Here. Otherwise, read on! Like Tulips, Mini Callas have a graceful, sculptural shape that looks amazing on their own or paired with other flowers. 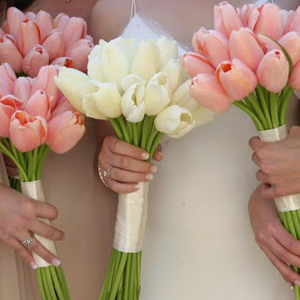 And while their prices are comparable as well, Tulips can be seasonal and they don’t have quite as many color options. Mini Callas are available in a range of colors and are grown year-round making them a popular choice. Fresh cut Amaryllis is seasonal, limited in production and can be finicky. 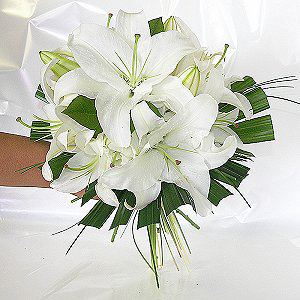 Oriental Lilies offer a similar large, star-shaped flower that is more predictable, available year round and in a variety of colors, as well as has the added benefit of a lovely scent. 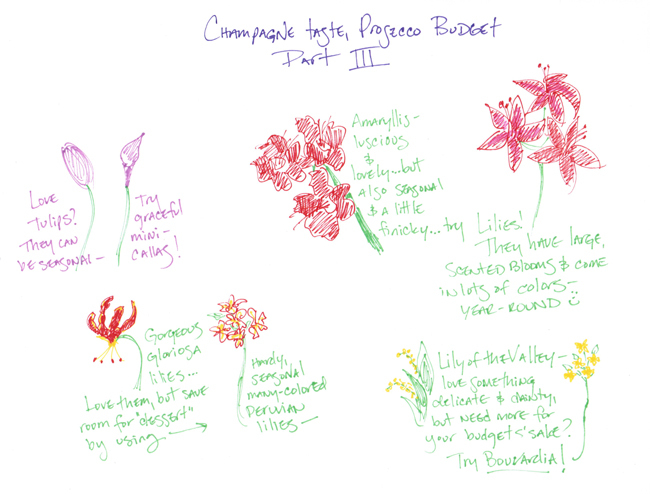 Asiatic and LA Hybrid Lilies are also similar substitutes, but have less of a scent, making them more appealing to those who are sensitive to Lilies. 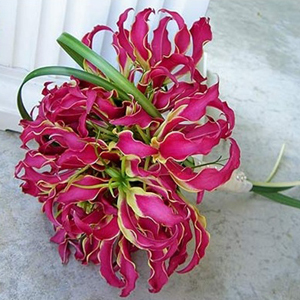 Gloriosa Lilies are really one of a kind blooms, with their slim, wavy petals and very exotic, tropical look. But they are only available in a few select colors and are quite pricey at $100 for 20 stems. 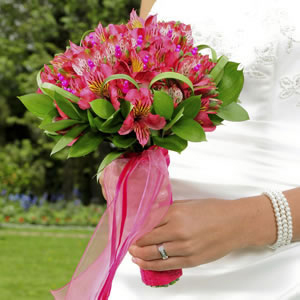 To create a similar look without breaking the bank, try using Peruvian Lilies (Alstroemeria). Peruvian Lilies are available in lots of colors and they feature 3-5 blooms per stem as well as some hearty greenery, giving you a lot for your money. 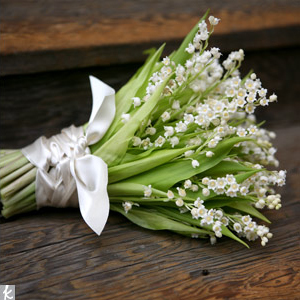 Lily of the Valley flowers are beautiful bell-shaped flowers with a sweet scent. Its small white blooms are extremely fragile and delicately rest upon broad basal leaves. Because it is so delicate and difficult to ship, it can be quite pricey. 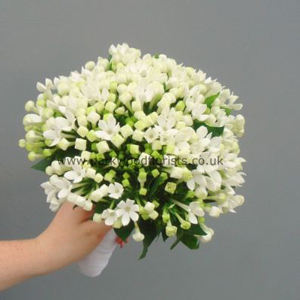 Bouvardia also features small white blooms with large green leaves but is much heartier and much more affordable! 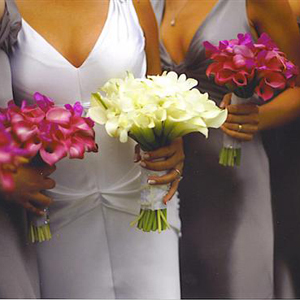 Both flowers look great as dainty, delicate, stand alone bouquets. I hope you enjoyed the last of our flower substitutions! 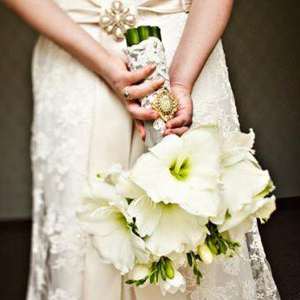 And Remember, if you need help planning your wedding flowers, make an appointment to chat with Violet today! Just call 1-877-507-6737 or use our live chat at FiftyFlowers.com to schedule!